S5 Bookmap demo with S5T! S5 Bookmap demo with Rithmic! The S5 BookMap is the original creator of the Depth of Market (Order Book) heat-map. The display combines detailed prints of trades being executed across the entire depth of prices. It is enhanced with an extended view of the quantity of contracts available at any price and how these orders have shifted over time to signal potential intent. Check it out! *Credit card is required to sign up. If you cancel your subscription before the end of the 14 day period, you will be refunded after the 14 days expire. * Lifetime includes access to current Bookmap beta 7 and also future release of Bookmap 8. 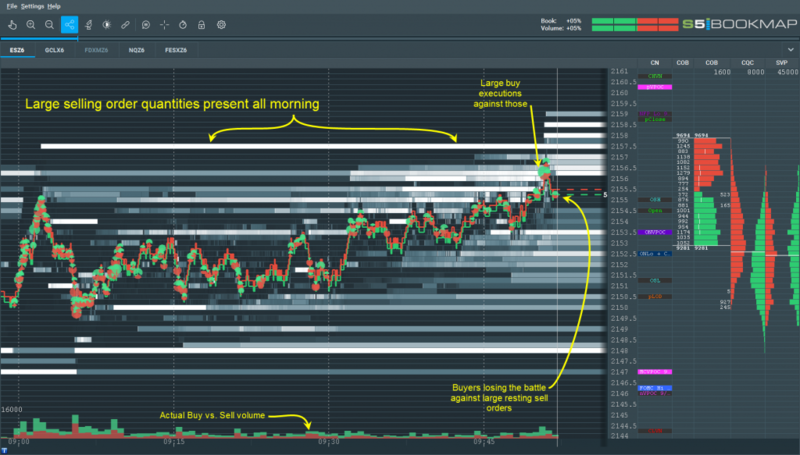 We believe the S5 BookMap provides traders with one of the most comprehensive and configurable heat map displays to visualize both real-time trading, as well as historical depth-of-market (DOM) data. The S5 BookMap’s unique java-based Complex Event Processing (CEP) engine handles millions of market data updates in real time, providing traders with information on how the limit order book evolves. Our goal is to provide a unique perspective that enables traders using the S5 Bookmap to get faster and deeper insight into live market dynamics and short-term price action. This tool includes add-ons to execute directly into your S5 Trader account and to see what you have done directly on the BookMap display.